Those words come from Dr. Chris Carruthers, who’s 72 and retired at age 65 after 35 years as an orthopedic surgeon practicing in Ottawa. 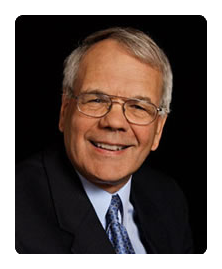 Carruthers enjoys a stimulating second mini-career as a corporate director and leader of physician-retirement workshops while enjoying the leisure pursuits of golf and travel with his wife of 46 years. His workshop-leader career launched in 2013 after he was asked to speak at Southlake Regional Health Centre, in Newmarket, Ont., on physician career transition. Identifying a need for these workshops, Carruthers built a network of Ottawa- and Toronto-area hospitals, where he leads seminars every two to three months. His corporate directorships evolved out of board work he undertook as chief of staff at Ottawa Hospital when he was practicing. He now sits on the boards of Carleton University, Ottawa International Airport Authority and Mach-Gaensslen Foundation. For doctors thinking about retiring, Carruthers recommends that they start planning 10 to 15 years in advance. Talk with your spouse and figure out how you envision your post-work years. The key, he says, is to find engaging, meaningful post-retirement activities while replacing the hospital-based social network that disappears when doctors hang up their stethoscopes. Although it’s easier to build on existing interests and hobbies than forge new ones, it’s still possible to chart new paths, and for that, he suggests doctors in their fifties or early sixties take a couple months’ mini-sabbatical to “test drive” new activities, such as volunteering or corporate board work, to see what might be a good fit in retirement. 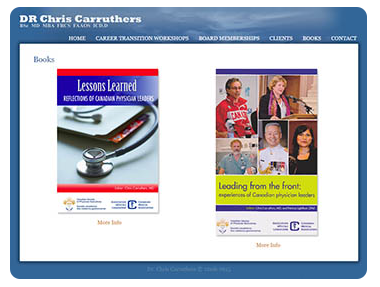 To find out more about Dr. Chris Carruthers physician retirement workshops visit ChrisCarruthersMD.com. With over 18 years of experience, RSRS has assisted physicians in every province with the closure, sale and overall transition of their practices along with the migration of the patients to new practices. 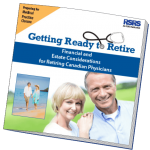 For physicians contemplating future retirement, RSRS offers a useful Financial and Estate Planning Guide, available for free download.